An incredibly rare offering exclusively from Secretariat.com. The racing world will once again pay tribute to Calvin Borel with the newest addition to his Churchill Downs bobblehead collection. With his victory aboard Super Saver in the 2010 renewal of the Kentucky Derby, Calvin became the first jockey in history to win the storied sporting event three times within four years. Super Saver joins Street Sense (2007) and Mine That Bird (2009) comprising Borel's terrific trio of winners. 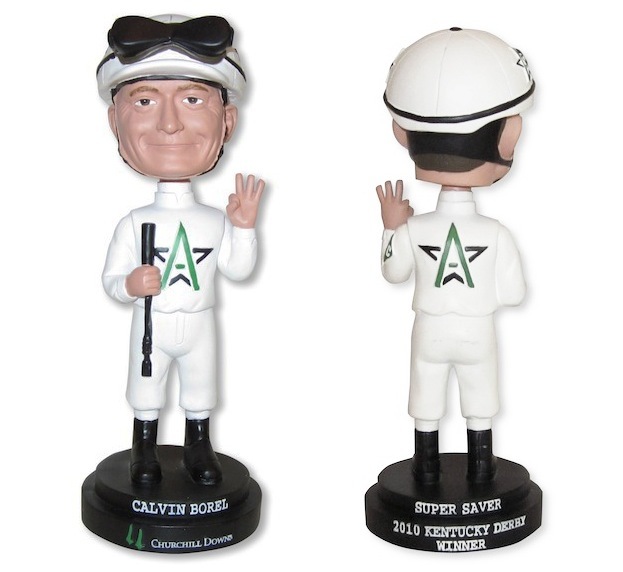 To honor this latest acheivement, we are proud to introduce the Calvin Borel Super Saver edition bobble produced in a limited quantity of just 500 total pieces. Additionally, Secretariat.com is now exclusively offering the first 136 bobbles in the edition on a first come - first serve basis. Each Calvin Borel Super Saver Bobble features the popular jockey in the distinguishing white silks of WinStar farm who bred and raced the talented colt. Distinctively different from Borel's prior bobbles, the Super Saver version features Borel extending three fingers representing each of his Derby wins. Each 7" bobble sits on a double pedestal noting the 2010 Derby accomplishment and comes with its own individual numbered certificate card hand-signed by Calvin. Like the Calvin Borel Limited Edition Rachel Alexandra Bobble released in 2009, we expect this bobble to sell-out quickly and dramatically increase in value. Currently, the Rachel Alexandra version sells for as much as $250 each on secondary market - a very smart investment. Secretariat fans might ask what is the connection of this offering to the immortal 1973 Triple Crown winner. The answer is the sale of the bobble supports two of Penny Chenery's and Ron Turcotte's favorite racing-related charities - the Race for Education and Old Friends equine retirement. A great bobble for a great cause, and remember.... purchase one of these extremely rare and collectible keepsakes now to be guaranteed the lowest edition number available.